GRAND PRIX PINBALL MACHINE !! Grand Prix racing is an immensely popular sport in Europe and around the world today, and Stern's Grand Prix pinball lives up to all the high-energy expectations of its fans. 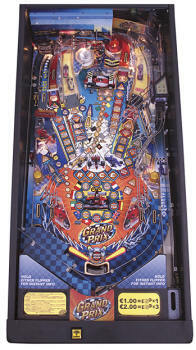 GRAND PRIX is a perfect piece for both homeowners and operators who like real excitement in their pinball. it like cars racing around a track. GRAND PRIX also features a semi-truck hauler that the player can launch a ball through, and a Grand Prix car that the player can hit with the pinball. The GRAND PRIX pinball machine is available with English, or also in Spanish, German, French, or Italian speech, display and instructions. expert sound engineer Chris Granner did the sound work. Pat Lawlor says, "GRAND PRIX Pinball is fast, addictive, and sure to complement any location!." to be acknowledged as World Champion! The Grand Prix Pinball Machine is UL, CUL and CE approved. All Stern Pinball Machines, are created and was completely Made In The USA with pride by American workers. 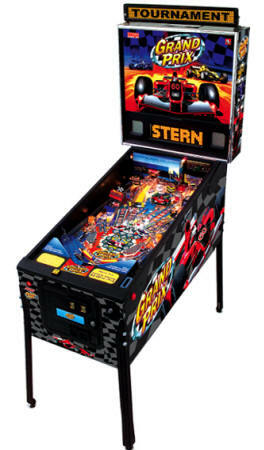 Click here for current pricing and availability of All Stern Pinball Machines!